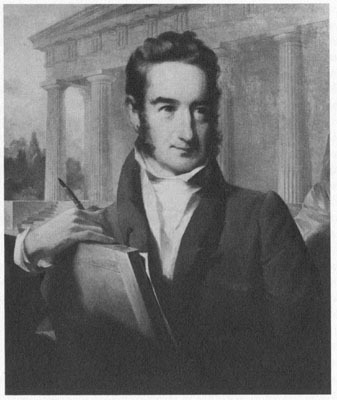 This is a portrait of William Strickland, the noted Philadelphia architect who designed the branch mints at Charlotte, Dahlonega, and New Orleans. His plans for the Charlotte Mint were also used for the Dahlonega Mint construction. He is best known as a proponent of the Greek Revival style of architecture. Source: Wilkinson, Henrietta H. The Mint Museum of Art at Charlotte, A Brief History. Charlotte, NC: Heritage Printers, 1973, page 13.